Technology is one of the main aspects that should be taken into consideration when you are planning to transform your organisation into a digital workplace. 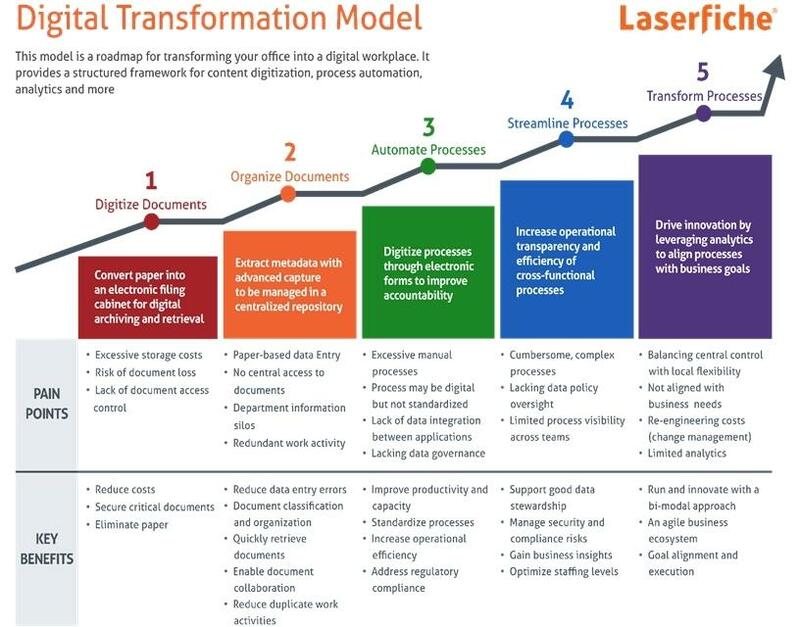 The Digital Transformation Model was developed by Laserfiche, to help businesses understand where they must begin with the transformation process. There are five main phases that every organisation should undergo on their journey of becoming digital. The first phase is to move from paper to digital information. When a company is struggling with managing paper documents, because it is scattered, difficult to find or unorganised, and the filing room is a mess, it means the company is in phase one of the Digital Transformation Model. The first step is to start scanning all the paper documents into electronic documents, enabling documents to be uploaded, viewed and even exported. Digital files will also serve as a backup for files lost in natural disasters. These files will then be gathered from disparate hard drives or personal cloud solutions into one central repository. Information will no longer need to be duplicated and the risk of data loss is secure, with restricted access to information. Phase two is the categorisation of documents. When you often have problems such as absence of rules, and classification results in inconsistent filing practices, digital documents being unorganised or not being able to obtain a certain digital document, it means your company is in phase two of the Digital Transformation Model. Documents such as invoices, for example, can now be put under the 'accounts payable' category, which will make it easy to navigate and easier to secure. File practices will also become consistent and work and collaboration will be streamlined; in other words, the documents that have to support compliance are immediately accessible. The third phase is the process of eliminating inefficient processes. Your company is in this phase when documents still originate on paper before being scanned into the repository, when processes aren't standardised, when certain tasks and processes are tracked in e-mails rather than the repository, and when business leaders lack the ability to manage and audit information access. In order to solve this problem, you have to eliminate all standardised paper forms and replace them with a smaller set of standardised electronic forms that can be submitted through your company's intranet. Forms can then be sent directly to relevant managers to be reviewed and signed. You will notice that wasted time and resources will be greatly reduced, repetitive processes will be defined and standardised, accountability for the way information is handled will be increased, and reports and audit tools will migrate the risk of non-compliance. * Automated processes are implemented, but they are really difficult for employees to understand. * There is no clear data policy oversight due to incomplete data. * You aren't able to measure the successes or failures. * When you have difficulty in integrating other people, such as customers into your process. Common processes such as filing documents should be automated at this point, to make it easier for employees to attend to tasks that need more focus. By the end of this phase, simplified processes will be easily adopted across the company, you will have complete and consistent data, you will be able to measure successes and failures by using tools such as dashboards and visualisations, and you will have the ability to include other people such as customers into your process. * Processes that are not aligned with business needs. * You can only make limited plans for the future. * Your organisation is reactive, but not proactive. Laserfiche has developed a process in which it can granularly examine how people are interacting with certain documents. This process is called descriptive analysis; it basically describes what has occurred in the past and facilitates an informed response. It can help managers to reveal unnecessary activities and identify dominant activities that take the most time and effort in a process. This phase also has another process, called predictive analysis, which examines processes at a macro level, detecting patterns in workflow-based processes on what has occurred in the past. By using these processes, organisations can plan processes more proactively and quickly respond to trends or changes in the market. Complex questions can be asked by business leaders and they can create scenarios without affecting live processes and waiting for results of their changes. Processes should now by directly aligned with business needs; the increased agility will enable companies to pivot in response to change, possible outcomes of scenarios can be predicted, and your organisation will now become proactive and be able to drive innovation. Be sure to continue with evolving your organisation after you've gone digital. Growing in the market and new technological advancements are important for the success of your company. In the most successful companies, innovation never stops. To find out in which phase your business is, please click here for a free assessment. Together with Laserfiche being the world's leading software for enterprise content management, business process automation, and productivity-boosting analytics, you can transform your business into a fully digital environment. Document management software is a crucial tool to digitally transform your business. Beyond the immediacy of going paperless, digitising documents and signatures are one of the first steps to transforming your workplace. Noscotek has rolled out the first of many digital contracts signing solutions using Laserfiche. If you want to learn more, contact Bianca Bornman (+27) 11 100 4678 bianca@noscotek.co.za. Laserfiche is a leading global provider of enterprise content management software empowering organizations to take control of information and business processes. With intuitive on-premises and cloud solutions for document management and process automation, Laserfiche improves productivity, efficiency and strategic decision-making for organizations looking to transform into a digital workplace. For more than three decades, Laserfiche has fostered an active user community that shares ideas and inspires solutions. To learn more, visit laserfiche.com/about-laserfiche.